We are excited to be back with our book reviews. Throughout the semester we will be interweaving book reviews in both English and Spanish, between our new blog member, Santi, and me. Santi will be writing reviews in Spanish, and I will be writing them in English. Since it’s February, the month of love, we will start by bringing you book reviews surrounding the theme of love for community. Today we are excited to bring you a review of Malaika’s Costume, written by Nadia L. Hohn and illustrated by Irene Luxbacher. This book is an Honorable Mention recipient of the 2017 Américas Award. 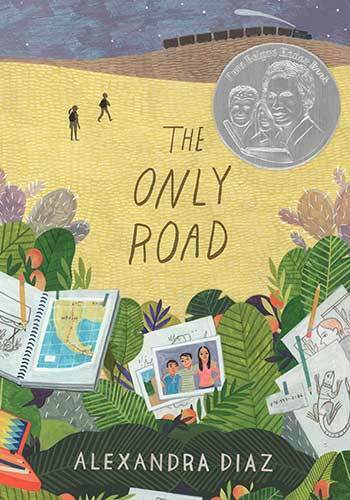 It tells the story of Malaika, a young girl in Jamaica living with her granny while her mummy works in Canada to provide for them. In the story, Malaika is struggling with not having a costume for carnival, one of the most exciting festivals in her town. Malaika’s worries and frustrations with the costume are interwoven with missing her mummy, struggling to allow her granny to fill that motherly role, and optimistic expectations of no longer having financial issues since her mummy is working in Canada. In the end, Malaika and her granny find a resolution and Malaika dances beautifully in Carnival. Luxbacher’s illustrations are absolutely breathtaking. I appreciated Malaika’s imaginative rendering of cold and snowy Canada, and how it contrasts her warm and colorful Jamaican hometown. The imaginative aspect of the illustrations mirrors Malaika’s personality. Hohn’s book as a whole explains important issues that countless children face with parents working from afar to provide for their families. Also, her description of complex relationships from a child’s perspective is refreshing and necessary within today’s multicultural society. Furthermore, Malaika’s day-to-day interactions with neighbors and extended family members give us cultural insight to life in small-town Jamaica. Hohn includes definitions of different words she uses for understanding the cultural context of the text, including explanations of different types of music, instruments, characters and foods. Although the story is told from Malaika’s point of view, the last page’s illustration allows us to place her mother within the story, and better understand her love for her daughter. I highly recommend checking out Nadia Hohn’s biography on her website. Nadia’s passion for children’s book diversity led her to publish Malaika’s Costume. She teaches French, music, and the arts at the Africentric Alternative School where she has been an inaugural staff member since its opening in 2009. She has taught in Toronto public schools since 2003. Out of her classroom and personal experiences, Hohn crafted edited two literary resources for teaching about Black heritage to grades 4-8, titled SANKOFA, which could be great for teaching this month, given that we are entering Black Heritage Month. Out of the resources in the guide, the SANKOFA Music book would pair well with Malaika’s Costume. While the music book must be purchased, Hohn also offers a number of free strategies for how to engage students with Malaika’s story. Teachers interested in using this book with their students might also turn to the Smithsonian’s educator materials, particularly their lesson plan (grades 3-5), titled “The Sounds of an Island: Jamaican Music for the Classroom.” You can also explore excerpts of calypso rock songs by the famous Jamaican calypsonians, Horace Johnson & The Eagle Star, on the Smithsonian Folkways site. For quick reference, here is a full audio recording of Horace Johnson’s music. These resources pair with Malaika’s Costume given that this colorful children’s book is as much about music and dance as it is about family. During the Carnival celebrations that inspired the book, the street is full of soca and calypso – musical traditions that are explained on the website for the Trinidad and Tobago’s National Library and Information System. If you enjoyed this book, we recommend that you check out the sequel, Malaika’s Winter Costume. Here is a promotional video for the sequel, which shows photos of Carnival in Jamaica.